“Cut alfalfa at late bud for optimum quality.” We’ve heard this statement, or a similar one, many times over the past 10 to 15 years. Although forage quality is strongly correlated to morphological stage (for example, late-bud or first flower), many years of monitoring the forage quality of a standing crop has taught us that environment plays an important role in what the actual forage quality might be at a specific stage of maturity. In other words, in a given year the forage quality at “late bud” might still be too high for harvesting, too low for dairy quality forage, or about right depending on the environment (primarily temperature and moisture) that the plants experienced during development. For this reason, it is important that forage producers understand the relationship between environment and forage quality. Temperature is the driving force behind most physiological processes that occur in a plant. These include photosynthesis, respiration, translocation of nutrients, carbon partitioning, and cell wall formation. It stands to reason that changing temperature will have a dramatic impact on what goes on inside the plant. We see these effects each and every year when comparing alfalfa regrowth and forage quality in summer to that of regrowth and quality in the fall. Alfalfa can actually increase in quality over time in the fall as a result of cooler growing temperatures. This is verified in some research done by Michael Collins at Wisconsin in 1983 (Table 1). In a Utah research trial, alfalfa ADF and NDF were compared from an intermountain area where night temperatures averaged 45°F to that of a lowland where night temperatures were 70°F. Daytime temperatures were similar in both areas. The ADF values for the alfalfa grown at the higher elevation were 28.2 percent compared to 31.9 for the alfalfa grown in the lowland. 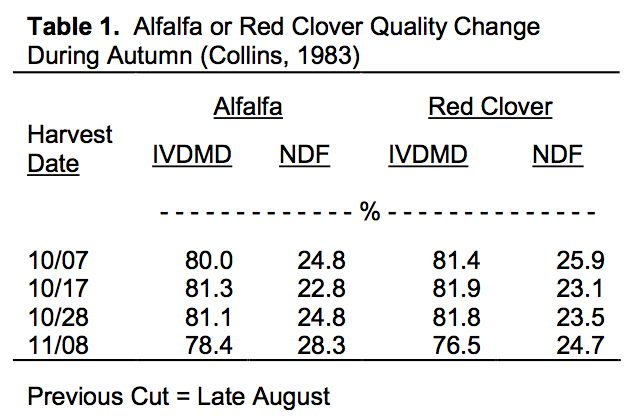 Similarly, NDF values for the high elevation alfalfa was 35.5 percent compared to 39.1 for the lowland. Although somewhat secondary to temperature, soil moisture status can also have a significant impact on alfalfa growth and forage quality. Mature alfalfa is about 75 to 80 percent water. In a 2 ton (dry matter) per acre standing crop, this translates to 8 tons of water. Yet, only 1 percent of the water that enters the growing plant is retained. Water (and lots of it!) is essential for alfalfa growth and any moisture deficit situation will have physiological ramifications. Drought conditions tend to delay plant maturity (if it occurs early in growth cycle), decreases plant height, increases leaf:stem ratio, and generally decreases NDF percent. Key environmental factors like temperature and soil moisture status cannot be disregarded when trying to explain or predict forage quality characteristics. Making a prediction of forage quality based solely on morphological stage often is erroneous when confounding environmental conditions exist. These environmental factors are interactive. For example, the ideal growing conditions from the standpoint of forage quality would be a cool drought (very rare but it did occur locally in 1992). However, the positive forage quality impact of dry conditions would be negated by high temperatures during a hot drought when forage quality drops fast and maturity accelerates. Environmental conditions are often the reason why forage quality is not what is expected in a harvested crop based on calendar days or stage of maturity. For this reason, knowing how these factors interact and impact forage quality can be a valuable knowledge base. To take some of the “guesswork” out of this year’s optimum first-cut harvest date, access alfalfa scissors-cut information (on this website in spring) or use PEAQ chart to determine forage quality in your own fields.